[Tim]’s Dice10 is an exercise in minimalism. Building an electronic dice using an ATtiny10 with code that fits within 1kB is not too difficult. Charlieplexing the LED’s would have used three of the four available GPIO pins. [Tim] upped the game by using just two GPIO pins to drive the seven LED’s for the dice. A third GPIO is used as a touch button input. Besides the ATtiny and the LED’s, the only other component used is a capacitor across the supply inputs. The LED’s are grouped in three pairs of two LED’s and a single centre LED. Usually, Charlieplexed LED’s are connected across pairs of GPIO pins. But his scheme includes connections to the 5V and GND terminals, besides the two GPIO pins. Building a truth table makes it easy to figure out what’s going on. Only the logic states used are listed in the table. It’s possible to add two more LED’s between PB0 and GND and one more anti-parallel with LED9, making a total of 10 LED’s driven by two pins. That’s quite a hack. The important thing here is to have two LED’s in series in the arms that connect to either 5V or GND. [Tim] has posted the code and hardware source files on his Github repo, and his blog post has some additional details on how he solved the problem. 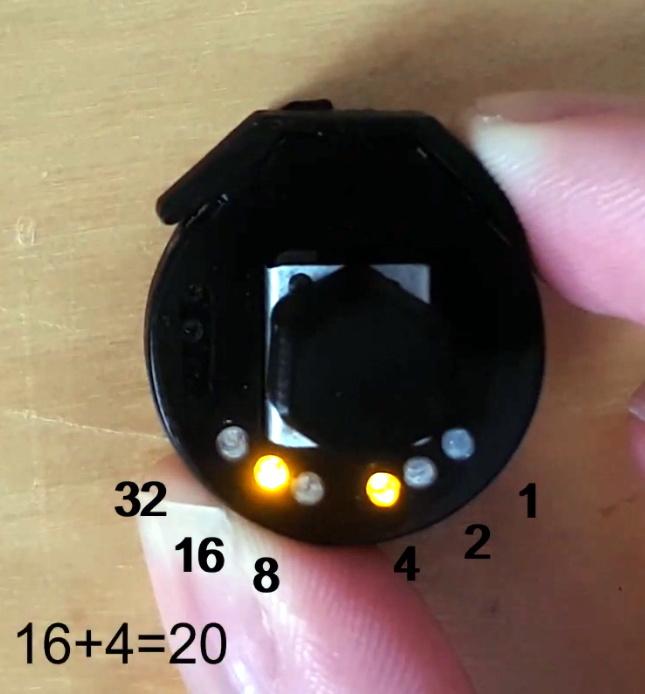 If you’re looking for more inspirations on minimal dice designs, check this “PIC powered pair of electronic dice” which uses a PIC 12F629 with five outputs driving a pair of 7 pips to make a dual dice. A pair of 6-sided electric dice (original in Dutch, here’s the Google Translate link) was sent in on the tip line for our ATtiny hacks theme. We really appreciate the simplicity of the circuit; it really shows how the complexity of discrete components can be cut down with a simple microcontroller. The circuit is very simple – An ATtiny26 serves as the core of the project. Fourteen LEDs are connected to fourteen pins on the micro. The tiny26 might be a bit overkill. With Charlieplexing, we suspect this build could have been completed with an 8-pin micro like an ATtiny25. The code for the build (written in BASIC with BASCOM-AVR), board files and schematics have all been posted. We’ve seen a few electronic dice builds before. 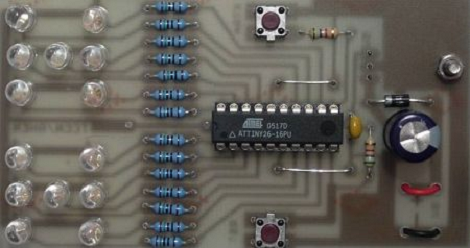 this build uses an ATmega328 in a hugely overwrought circuit. Compared to what can be done with a 555, the ATtiny26 build provides a very nice middle ground. Thanks [Roeland] for sending this in.